If you are flooded with countless pop-ups and other commercial advertisements you ought to check whether you have WebGet installed on your system or not. This adware application ALWAYS comes bundled with other freeware programs, so chances are that you have more than just one potentially unwanted application installed on your computer. Since adware applications could be related to malevolent third parties, it is in your best interest to remove WebGet from your computer right now. You would also safeguard your system from other threats if you decide to invest in a licensed antimalware tool. 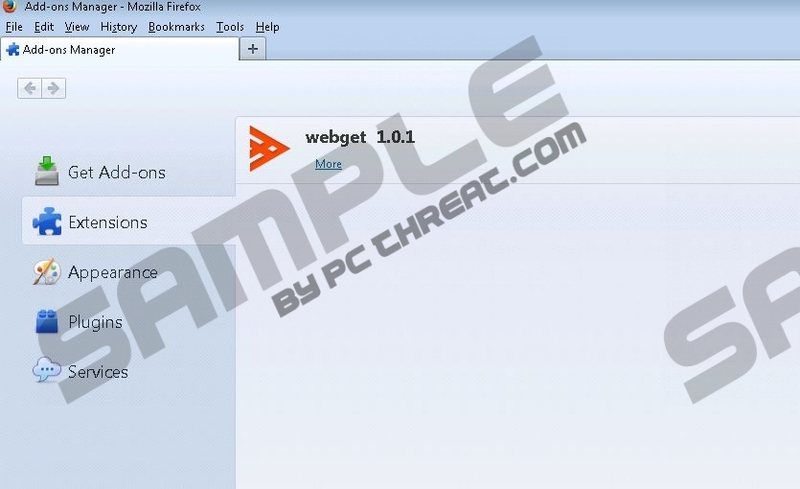 WebGet comes from SuperWeb family of adware applications. It is a huge group of browser extensions that are compatible with Google Chrome, Internet Explorer and Mozilla Firefox web browsers, which includes such unwanted applications as Cling Clang, WiseEnhance or CrankWeb, although there are many more. Once the application is installed on your computer, it adds an extension to your default browser and it starts collecting data on your web browsing habits. The data is being collected in order to create your online profile and then generate a custom flow of commercial advertisements. Custom pop-ups increase the possibility of you clicking WebGet ads, but it is obvious that clicking the ads is not a good idea. Adware applications often redirect users to affiliated third party websites in order to increase their traffic count and consequently generate money for the adware creators. This kind of practice is not illegal, and quite a few users decide to tolerate WebGet and keep it on their computers, but that is not a wise choice exactly. Even if WebGet does not intend to rip you off or infect you with malware, it does not mean it cannot be exploited to do so. The main security concern related to this application is that WebGet and other similar apps seldom check the reliability of the third party content that is displayed on their advertisements. Therefore, almost anyone can embed their content on WebGet ads as long as they know how to. If the advertisement server utilized by WebGet gets hacked, chances are that you will get redirected to suspicious websites that distribute adware and potentially unwanted applications. Therefore, it is clear that you have to remove WebGet from your computer. Since webwebget.com does not distribute the application directly, WebGet comes bundled with freeware applications. Thus, it means that along with WebGet you will need to terminate a list of other potentially unwanted applications as well. Run a full system scan with a reliable computer security application and then get rid of all the programs that might be related to computer security issues. If you have any additional questions, feel free to leave us a comment below. Select Uninstall a program and remove WebGet. Go to Uninstall a program and remove WebGet. Select Add or remove programs and uninstall WebGet. Quick & tested solution for WebGet removal.